Deerfield Beach City Manager Burgess Hanson resigned from his office this past Friday. You’ll find his letter of resignation below. City officials have been tight lipped about the resignation. No one we spoke to was willing to discuss the reasons behind it or would comment on how voluntary it may or may not have been. City Hall spokesperson, Rebecca Medina Stewart, would say only that, the matter would be addressed “at the meeting tomorrow [Tuesday] night. Two lines in the resignation stood out to me. He said he was resigning “to live a better, healthier life”. Definitely unusual wording. Hanson was not known to be ill. Perhaps he was tiring of his daily commute from his home up in Loxahatchee. Of course, a city manager living so far from the office (roughly 45 miles each way) is pretty unusual in and of itself. The city commission made that concession to Hanson in 2015 when he was being wooed by another city and Deerfield Beach wanted to badly keep him in place. I remember the Sun-Sentinel covering the city’s efforts back then. My how things can change in a few years. Hanson also said he was making “an important decision and your final one as your city manager.” Which is an interesting choice of words considering he is remaining on the job until June 1st. You can find more details of the resignation in our earlier report: Deerfield Beach City Manager has resigned. Hanson has worked for the city of Deerfield Beach since 2001 and took over the City Manager responsibilities in 2010. According to the letter, his last day would be June 1, 2019. Hanson had been relatively popular for most of his years as city manager but several controversies have arisen of late that have caused him to receive a fair amount of criticism. This may have been at least part of the impetus for Burgess to leave, although whether or not his resignation was truly voluntary is still not clear but is the cause of much speculation. For more Deerfield Beach news and events information you can go to our website and read our publication, Deerfield Beach Magazine. 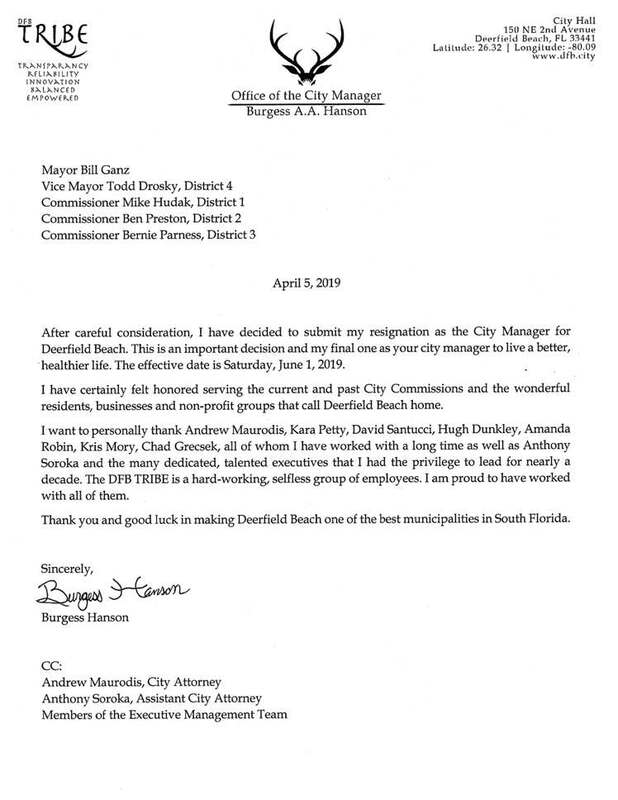 BELOW: Burgess Hanson Deerfield Beach City Manager in 2014 photo from Zimbio; Letter of Resignation- April 5, 2019.